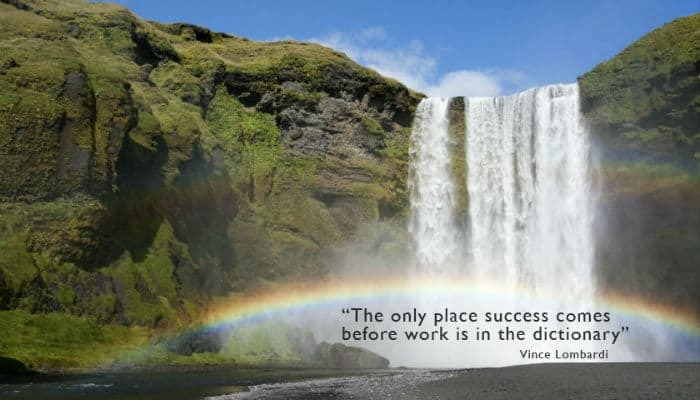 “the only place success comes before work is in the dictionary”. A legendary quote from NFL legend Vince Lombardi that can be associated with every walk of life. The message is clear; success does not just fall into someone's lap, they have to possess the drive and motivations to go out there and earn it. The symbolic image of the waterfalls behind this message get that across in a very clever way. Encouraging somebody to go out and do everything they can to achieve their goals should be easy, you just tell them right? But what if this is somebody you have only ever come into contact through your work, how do you tell somebody you only know to say hello to that they should fight for the success they so richly deserve? We have already answered that questions; send them these Success corporate ecards. You may or may not feel the need to add your own personal message as well that is entirely your choice. Either way, anyone who is at a crossroads in their career, or is undecided about going for that promotion, will appreciate receiving this card by email. Sending our ecards is of course more prevalent at Christmas time and that is where we really excel as a specialist provider of Christmas ecards for business.